We were super stoked to table an awesome event with Save The Waves for an intimate evening of discussion on the topics of the social impact of surfing on women’s empowerment with Easkey Britton, PhD, guest speakers, and a panel of local female big wave surfers. The evening included a film short by Farhana Huq / Brown Girl Surf, “Surfing Possibility: The surfer girls of India”, and a sneak peek at the new trailer for “It Ain’t Pretty, A film about women who surf Ocean Beach” by Dayla Soul. 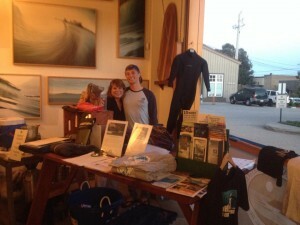 Save The Waves hosted with support from Santa Cruz chapter of Surfrider Foundaiton, the Seymour Marine Discovery Center, and Sawyer Land and Sea Supply in welcoming Dr. Britton. Post by Save The Waves.